Correspondent photos by LORETTA JACKSON Coaches Zack Gould and Mackenzie Phelps await the return of some gently pitched tennis balls by some of the youngest players, kids in the 8-and-under division of the summer junior league hosted by Granite State Kids, a nonprofit Bedford-based organization now in its 17th season. 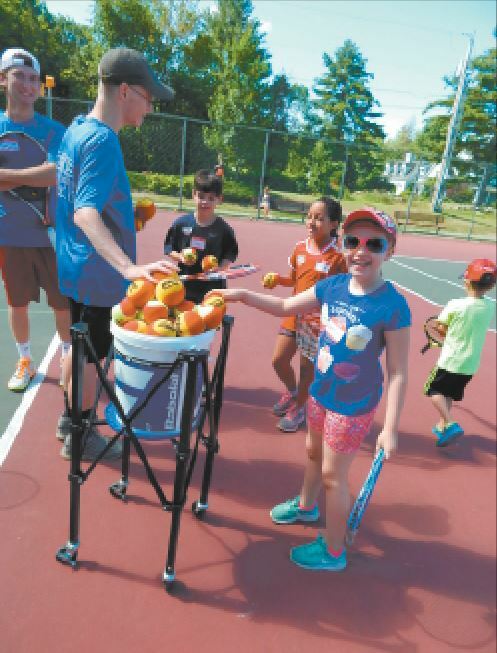 The thwack of tennis balls propelled by four- and five-year olds learning how to play tennis is the tipoff that the Granite State Kids Junior Team Tennis League is in progress. 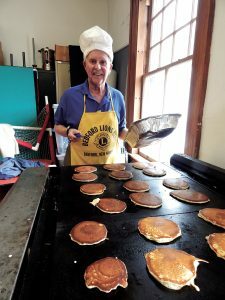 The Monday gatherings for players up to age 18 are a tradition of 17 seasons and are now underway at the County Road tennis courts near Bedford High School. League coordinator Diane Phelps, who founded the GSK, a nonprofit organization credentialed by the United States Tennis Association, said at the practice on Monday, June 26, that the early-morning group of youngsters ages 10 and under offers some outstanding opportunities for growth, as players and as young people. Phelps said her contingent of coaches, all highly experienced, is led by masterful expert Skip Burbine, of Londonderry. Other helpers are adept at the sport and some have found places on college teams or in high-level competition. The four- and five-year olds, followed by those under age 10, occupied the courts from 9 a.m. to 10:30 that day. Around 22 received their share of instruction from a dozen or more coaches. Later in the day, players in older age groups participated. Phelps said there are around 100 players up to age 18 in this year’s summer league. Among the coaches is Mackenzie Phelps, 23, the youngest of Diane’s children. Mackenzie began playing at age 4. The GSK also offers teams and coaches opportunities for court time that enables their own practices. Recreational, intermediate and advanced levels offer additional coaching that can guide players toward high levels of competition in USTA-sanctioned matches. Local, regional and national opportunities can be explored through GSK programs. Diane’s oldest grandchild, Arriel Phelps, 7, of Amherst, also plays tennis. She took to the court that morning and smoothly executed her serves and backhanded returns. Unknown to her but shared here from online sources is perhaps a potential goal: hit the world’s fastest serve. Currently, the record holder is Sam Groth of Australia, whose 2015 service was recorded at 163.7 mph. American champion Venus Williams has hit at 207 mph, while her sister, Serena, has slammed a serve at 206, according to Wikipedia. The GSK youngsters on hand Monday are working up to the challenge. The elder Phelps voiced some other benefits to the program. She said the kids learn skills through tennis that will be valuable for the rest of their lives.